Crystal of the Day for Monday 21 October 2013 is Papagoite. 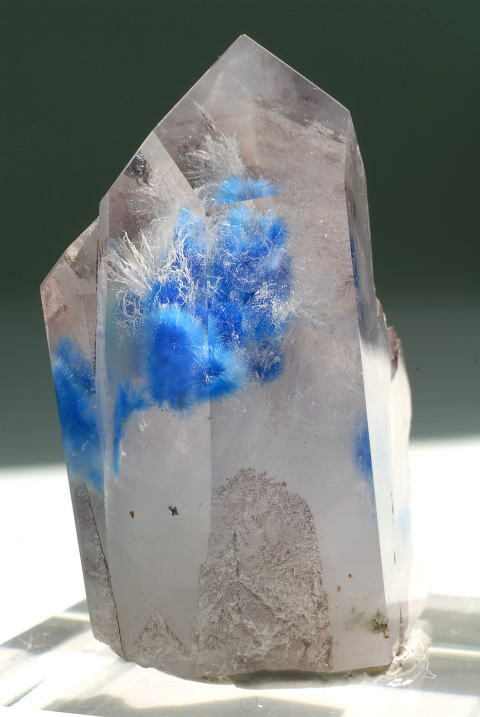 Papagoite is a combination of ajoite, papagoite and quartz. Bottom part of crystal is in its natural state. From the original Messina, South Africa mine, these specimens are rare and difficult to buy since the mine is closed. AJOITE: Mainly in the form of phantoms within crystals. These are powerful tools. Produces a melding between heart & throat chakras and allows speaking that of one’s heart. Provides peacefulness in emotional system and joyful acceptance of one’s surroundings, circumstances, and environment. One of the most beautiful, joyous & loving crystals of the earth. PAPAGOITE: A copper-based mineral with a rich, blue color. Sends forth a gentle and calming energy; excellent for clearing the throat and third-eye chakras, aiding in verbalization with clarity. Useful in bonding relationships between one and family, friends and all of existence. Quartz/papagoite combination aids in communication of transmission and reception. QUARTZ – PHANTOM: Crystals with a distinct outline of another crystal within them, or even containing another complete crystal formation. Phantom crystals because of their pyramidal geometry, are associated with the ability to help one reconnect with past life memories of initiations in the pyramids and past lives in general. CHAKRAs: Third eye, Heart & Throat.